Alien Zigor, coming from 962 million light years away, landed to the Barzoland while Barzo was sound asleep. The place he landed was the garden of Barzo's. His aim was to steal the middle of the eyebrow of the man who has the brushiest eyebrow in the world. Because he needed a brushy moustache to be able to look bad, more charismatic. 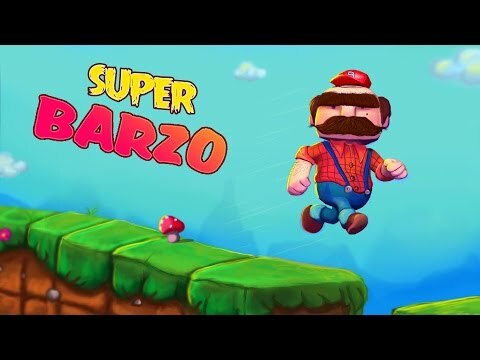 Because of he couldn't have moustache, his only hope was Barzo. He came into his house sneakily and removed the middle , which is the most vital part, of his eyebrow by rubbing with shaving blade and took it.He was achieved his goal. He had moustache now. He thought about staying for 2-3 days while he came but he was about to do the biggest mistake of his life. Barzo woke up and realized his eyebrow was stolen. Barzo learned the thief of his eyebrow from his neighbor, got so angry and now he was running into a big adventure to take his revenge from Allien Zigor. every level in time. Enjoy the classic platform game, now with enhanced playability! Jump and shoot at the aliens in this retro style, classic free platform game. levels . The challenge awaits you!! Get rid of invading aliens. Save the Earth in this Retro Style Platform Game – Aliens in my BackYard!! A realistically styled 3D & 2D World! Lots of enemies to defeat. If you like retro style classic platform game then this is for you as free.